The Best Bottom Training Kit was designed with the help of toddlers to encourage your child to take ownership of their potty training. Best Bottom Potty Training Kit - Made With Toddlers in Mind! The folks at Best Bottom went to the experts when they designed their potty training system--we're talking about toddlers, of course! 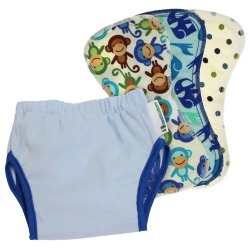 These potty training pants were designed as a sized system because toddlers identify one-size pants as diapers. Side snap trainers are popular with parents, but in the Best Bottom trials they were ALSO called out as diapers by the discriminating toddler panel. The final Best Bottom design is a pull-on training pant with a soft cotton outer and comfortable elastic waist that look and feel just like real underwear paired with FeelWET™ inserts that snap in and out whenever there is an accident. There is an inner waterproof layer and wick-resistant trim around the legs that both help prevent leaks. The FeelWET™ inserts are constructed of fun prints to deter accidents--afterall, we don't want to get our monkeys or elephants wet, do we? Why Should You Try the Best Bottom Training Kit? There are a lot of potty training options on the market these days, but the Best Bottom Potty Training Kit has a lot to offer. Best Value - Compared to other trainer kits, the Best Bottom kit is more affordable and costs less per change. FeelWET™ - When your child feels wet, he or she will be more likely to want to change his or her pants. This behavior generally leads to quicker potty training. Kids' Choice - These training pants were designed with toddlers' likes and dislikes in mind. They are toddler tested and approved! Reusable - Washable, reusable training pants save your family money. They can be used on future children, too. Don't throw your money away! How Does The Best Bottom Potty Training Kit Work? Snap FeelWET™ insert into pant and let your child pull up the pant themselves. If there is an accident, unsnap the wet insert and snap-in a clean FeelWET™ insert. You may be wondering, "what about #2?" If your child should soil their training pant, have them gentle slide the training pant down their legs and off their feet. 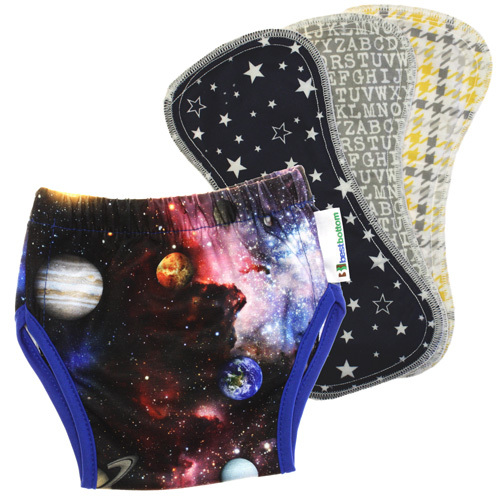 Plop the solid matter in the toilet before storing with your other wet and dirty inserts and pants. Changing a soiled training pant may seem like a hassle, and for this reason many parents prefer snap-on trainers, but it is important to remember that these consequences are learning experiences for our children and are often important milestones in learning to use the potty. 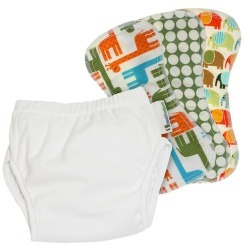 If your child needs additional absorbency, we recommend the Best Bottom doublers and overnight inserts in sizes small or medium. You see, the Best Bottom brand of products are made to be interchangeable. It is what the folks at Best Bottom refer to as their Full Circle System. The colors and prints of your inserts may vary. The kits are prepackaged by the manufacturer, and as such we are not able to accommodate requests for specific prints on your inserts. Flip Potty Trainers are a unique pull-up, pull-down, snap-off, one-size potty training system made with replaceable one-size pads. I ordered the medium size for my very petite 2yo. We got them and love the system. So easy. She had an accident right off the bat on first wear (of course) and it was so easy to just swap out the insert and keep going! 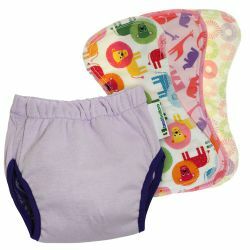 She loves the fun prints on the inserts and it helps her want to stay dry because she doesnt want to get her elephants and zebras wet! The only downside is the leg holes... I do not know if this has been a problem for anybody else or if it is simply because my child is so petite, but they are quite large. Luckily, the insert absorbs quickly enough that we haven't had any leaks out of the leg holes, but if I order another set, I think I am going to go down a size because they are just way too big there and there is no elastic there to have a slightly customized fit. I didn't really like this ..I like the style ...snap in insert and like pants ..pull it up ..but it has a poor sizing ..runs small . I really like the style and ease of these potty training kits, I haven't gotten much use out of them as my big guy still isn't ready but we do break them out every couple of months to see if he's peaked an interest. They seem comfortable, and I love that unlike underwear accidents don't end up everywhere. These are some of my favorite trainers I have purchased for my potty training twins. I love the inserts which means you can reuse the trainers as long as they don’t have a full pee and I like that I can use our medium and small diaper inserts for car trips if I need to. I wish they had side snaps though for poopy accidents for easier clean up. Great Quality. Washes well. No fading. We were using pull ups before and if my daughter had accidents she wouldn’t see to notice or care...this was our saving grace. She would notice right away if she had an accident and we didn’t have to change her pants just the insert. Love the snap feature to hold it into place. My daughter loved wearing them. Comfortable. Easy for her to pull up and pull down. Only down fall is they are a pain to take off if your child pooped...poop gets all over legs wish the sides opened up via Velcro to avoid the extra mess.